Originally a farmer's dog, the Lakeland Terrier was used to exterminate foxes that raided the sheep during lambing season. Most terriers are only bred to bolt the fox or other quarry, but the Lakeland Terrier was unafraid to enter the lair and kill them. 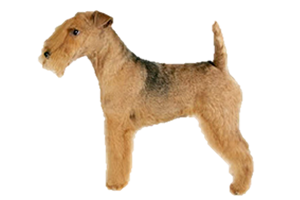 The Lakeland Terrier originated in the Lake District of Cumberland, England, near the Scottish border and dates back to the 1700s. They were likely developed from the now extinct Old English Black and Tan Terrier and several other crosses. Other breeds thought to have contributed to the bloodline are the Wire Fox, Border, Bedlington, Welsh and early Dandie Dinmont Terriers. Is the Lakeland Terrier Right for You?